The San Jose Blog: New Downtown San Jose Dog Park opens on October 11th! New Downtown San Jose Dog Park opens on October 11th! 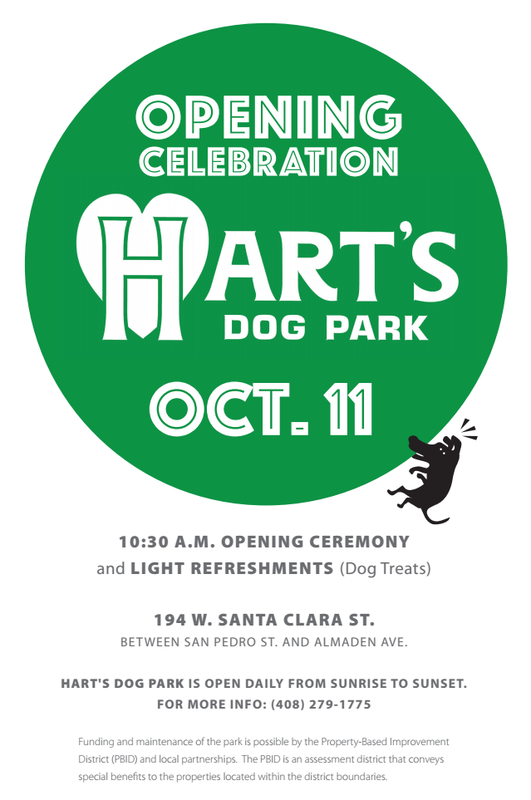 Hart's Dog Park is located in the Downtown core at 194 W. Santa Clara Street (between San Pedro St. and Almaden Avenue). To launch the new park, there will be an opening celebration on Tuesday, October 11th at 10:30am complete with dog treats. The Downtown PBID worked with the SJ Downtown Association to create this urban park for the rising number of Downtown residents with dogs. The 2,000+ high-rise apartments built in the last five years are all within a quarter-mile of the new park. The park is 2,000 SQFT with a double gate, artificial turf, benches, planters, and tree stumps. A mural by local artist Tom Colla will adorn the wall and honor one of San Jose's most famous department stores. The park will also be maintained by Groundwex. This is a fantastic way to re-purpose abandoned/vacant space. A fire destroyed the previous structure and this space has sat empty for a decade. Much like the small park next to Axis, this is a great way to enhance the quality of life for residents and visitors while also filling up the gaps in our streets. So, what is the real deal with that Lee Yick Laundry place? It's just going to sit there forever or what?